The dill and sour cream give this sauce a nice kick. 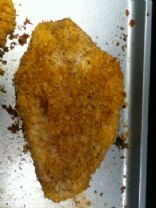 Great way to get in one of your servings of fish during the week! This is the best kind of healthy recipe makeover: the kind no one will notice. Believe us when we say this dish is one of the best meals we've ever eaten. Biting into a perfectly crispy fried shrimp is so satisfying. The 10 grams of fat per serving? Not so satisfying. This dish has all the crunch, with much less fat. This is WONDERFUL! The contrast between the sweet honey and savory ginger and garlic makes this fish amazing. Citrus and cilantro dress up grilled fish. There is almost no fat in this recipe. Recipe can be doubled to 48-52 shrimp which is enough to feed a crowd! Cooking time is estimated depending on the size of the shrimp. Serve with pineapple or a fruit salsa. These sweet and spicy shrimp will be the star of your next barbecue! 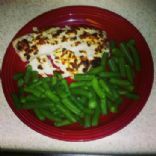 In just 30 minutes, you can have a light dinner entree that's packed with protein and fresh produce. 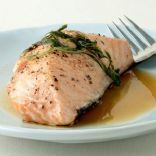 Serve this sweet and savory salmon with a green salad and brown rice for a well-rounded meal. No, you did not just walk into a fancy restaurant. You can make this springtime dish in your own kitchen--in mere minutes! I don't know a kid who doesn't love the combo of cheese and barbecue sauce. This dish is a swap on mac-n-cheese and BBQ chicken that's quick and grown-up approved. Light and fruity, this simple fish dish gets a double dose of flavor from the coriander plant. The lemony seeds add freshness to the fish, while the vibrant leaves make the finished meal "pop." Spicy and creamy shrimp, pasta and vegetables. Not only does this recipe have only six simple ingredients, but it also requires almost no cleanup! Cooking in parchment seals in flavor and moisture without any added fat. My family loves this recipe. Chicken can be substituted for the shrimp. This recipe is simple to make. I use fat free chicken broth to greatly reduce the calories. This is really delicious and flavorful. Serve over brown rice, or quinoa for a healthy, easy meal.